Do you want a recipe for a wonderful evening in the theater? 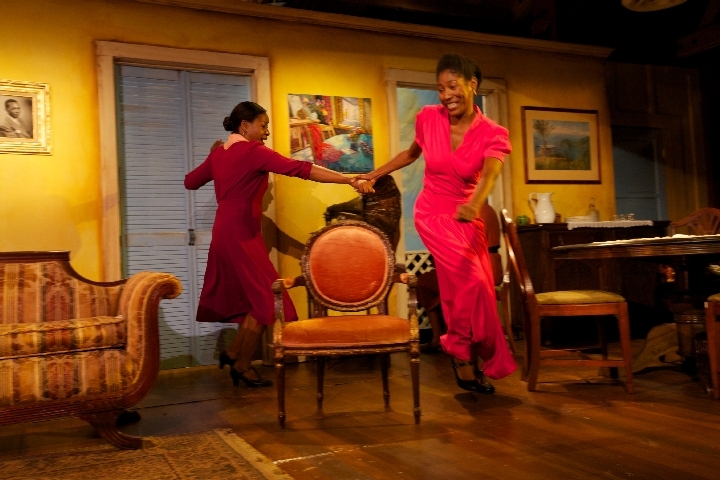 Take the story of Chekov’s classic Three Sisters, add the backdrop of Trinidad in 1941 and playwright, Mustapha Matura, creates for you a family drama filled with laughter and tears. Lower Depth Theatre Ensemble presents their inaugural production, Three Sisters after Chekhov, at The Lost Studio Theatre in Hollywood, California. What a great choice to announce this theater group to Los Angeles. Gregg T. Daniel, Artistic Director of Lower Depth, directs this performance and one can tell that this piece is a true joy to him. These three sisters are stewarded by Mr. Daniel with care and tenderness. He has chosen three talented actresses who can fill in the details of these wonderful characters. Diarra Kilpatric, Yvonne Huff and Veralyn Jones come together to create three distinctive diverse sisters who love each other. They seem to be in charge since their father died, wanting to maintain the family home and the life style in which they were raised. Living in the shadow of World War II, these educated Trinidadian women weave a complex tapestry of a family. The audience, learn the most about these sisters when they are alone with each other. In fact, the men that surround these sisters know much less about these women then we do since only we have front row seats to their intimate conversations. The relationship between the two characters of Helen and Richard is beautifully depicted by Yvonne Huff and Douglas Dickerman and the connection between these two characters is touching. The audience can see the true beauty of this badly timed meeting which blossoms into a relationship that is also badly timed! Watching these two actors become these two characters is truly a pleasure and you find yourself waiting to see them again. The production is blessed to have an experienced actress, Veralyn Jones playing the part of the eldest sister, Alma, and even though the role is sparse, Ms. Jones fills it to the brim. She brings the necessary tenderness and dignity to the part. Diarra Oni Kilipatrick is charming as the idealist younger sister Audrey, while Nadege August as Jean does well in the role of her cheeky character. For the most part, the actors give us solid performances and Michael Ralph cast as Lt. Edward Scott and Miron E. Willis as Francis both make strong choices in their roles, whereas there is some confusion concerning the choices that Terrence Colby Clemons makes in his role as the younger brother Peter. Although, the role of Peter might not be as well developed by the playwright as some of the other characters, Mr. Clemons’ performance seems somewhat forced. Playwright Mustapha Matura, at times telegraphs the plot, the actors and the director give us a fine performance of this play and it certainly is a piece that the this company can be proud of producing. Leon Morenzie should be commended for his preparation of the accents with the actors. I find it is always a challenge to combine the requirement of the accent with making sure that the audience can easily understand the dialogue. The cast with Mr. Morenzie’s help accomplished the necessary balance. The production staff has created a wonderful set and costumes to support the story and the actors and Scenic Designer Shaun Motley and Costume Designer Naila Aladdin Sanders should be congratulated. The company of Lower Depth Theatre Ensemble can be proud of their first production and we look forward to seeing more of what they will be offering to Los Angeles audiences.